Change the date! Balance of power celebrations rescheduled for February! As you may already know, celebrations to mark the 10th anniversary of the Greens holding the balance of power in the ACT are being rescheduled to early next year - so as many members, former MLAs and staff as possible can attend and enjoy the night. If you have already paid for your ticket for the get together planned for next Friday (9 November) I want to let you know we’ve now processed your refund. If your refund hasn’t popped up in your account by Thursday 7 November - please call Tim at the office on 0435 059 040. Over the past 10 years by holding the balance of power we've delivered so much for the community and a sustainable future for Canberra. And we couldn't have done it without you! So please keep an eye out for the NEW DATE TO CELEBRATE in our Members’ Bulletin and Facebook pages - so we can celebrate all of these achievements together and look to the future - a future for all of us. Yours with pride in our achievements. We've shown the world we can share power and achieve significant positive change for our community. Imagine the impact we could have in the future if we get Tim Hollo and Dr Penny Kyburz elected to the house on the hill and more MLAs elected to the Assembly in 2020. In the ACT, we know that electing Greens delivers progressive social change and bold climate action. Campaigning to elect Greens is the most powerful thing we can do together and the contributions of our members, volunteers and supporters will be essential. If you have any items or experiences you’d like to donate for us to auction for the campaign fund please email Josh at campaign@act.greens.org.au. 2008: Four Greens elected to Balance of Power in ACT Assembly. 1st Parliamentary Agreement signed. First Greens Speakership in the world. 2009: First Red Rapid bus route starts. Largest ever ACT boost to mental health funding, especially to community sector. 2010: ACT climate target legislation enacted to reduce emissions by 40% by 2020. Problem Gambling Assistance Fund established through Greens legislation. 2011: Plastic bag ban starts. 2012: 2nd Parliamentary Agreement signed, including commitment to Light Rail. Shane Rattenbury elected as first Greens Minister in the ACT. ACT Government stops investing in tobacco, gaming, cluster bombs & land mines. 2013: Marriage equality, the first time. 2014: $93.5M funding for lakes and waterways. Drinking fountains rolled out across Canberra to reduce plastic bottle use. Battery hens and sow stalls banned. ACT’s first solar farm opens at Royalla. 2015: Common Ground low income and homelessness housing opens. Puppy farms banned. Active Travel Office established. Greens legislation to introduce exclusion zones around abortion clinics passed. 2016: 3rd Parliamentary Agreement signed. Policy change to limit police pursuits. Best practice FOI legislation passed. 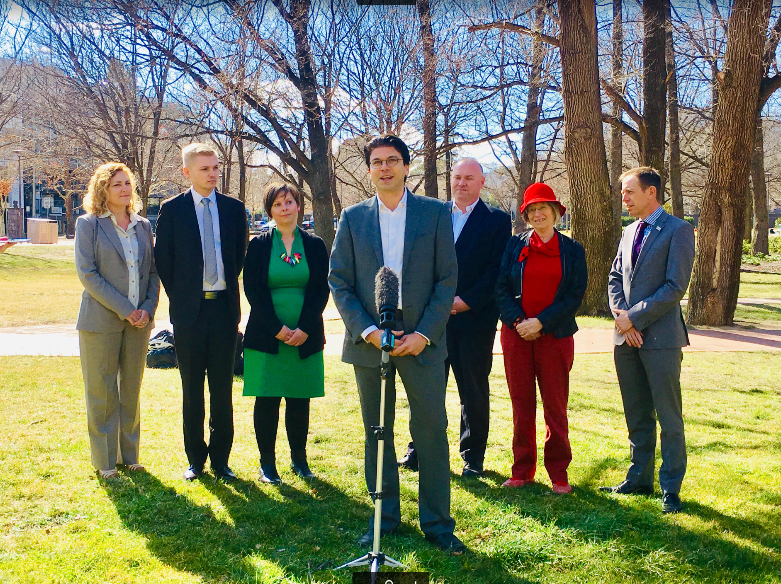 ACT's first ministerial portfolio of Mental Health created. 2017: End of government funding for greyhound racing. Housing summit to develop housing strategy. ACT's first citizens' jury. Please help us and let your friends, colleagues and followers know about our page: Change the date! Balance of power celebrations rescheduled for February! Authorised by Jo Root, ACT Greens, 2/97 Northbourne Avenue, Turner ACT 2612.